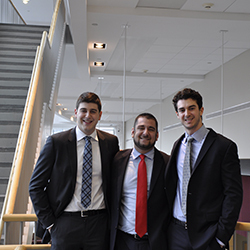 Tom Jaeger ’15, David Weinstein ’15, and Tyler Shine ’14 won the 2014 International Hotel Investment Forum (IHIF) Student Challenge in Berlin, Germany. Students were provided a case study about an investment opportunity and were challenged underwrite the investment and make strategic recommendations on acquisition pricing, positioning, branding, leverage and exit strategy. The Cornell School of Hotel of Administration Team, coached by Professor Dan Quan, competed against Ecole hôtelière de Lausanne and NHTV Breda University of Applied Sciences. Professor Dan Quan, had high praise for their achievement: “I’m incredibly proud of the students who competed in the IHIF Student Challenge this year. Working together, they drew on all the skills they’ve learned in and out of the classroom.” Quan is the academic director of The Center for Real Estate and Finance (CREF), the epicenter of hospitality real estate, finance and asset management at Cornell and an active conduit that exposes students to relevant industry opportunities.